Are you moving awkward, unusual, or special items? If so, you need a moving company like Suburban Solutions. Packing clothing, linens, and toys is a pretty simple part of the moving process. When it comes to glassware, china, or fragile items, it’s understandable if you feel a bit anxious. Add in the idea of transporting specialty items, and you might wonder whether this is all possible without anything going wrong. Luckily, it is possible when you choose Suburban Solutions to be your moving company. No matter what you are moving, you can rest easy knowing our professional team will look after all of your belongings and treat them as if they were their own. We also offer various coverage options to ensure that all of your belongings are protected against unexpected events. To learn more about our moving services, call Suburban Solutions today. Pianos: Pianos, especially grand pianos, are both extremely heavy and extremely delicate. This means they generally require an experienced moving company to move from one location to another in Washington DC. Many newer models have detachable legs, which can help the moving process. Even so, you shouldn’t move a piano without the help of a special items moving company. Fine Art and Statutes: Any type of art, such as paintings, art, carvings, and other delicate items, should never be packed in a standard manner using boxes and tape. If you have any forms of art that are rare, valuable, or fragile, you’ll want to consider hiring an experienced moving company. Suburban Solutions understands the delicacy and value of your art and our movers are able to properly wrap and pack items so they are safe from the elements. We also use special, custom-made crating for items that are extra large, fragile, bulky, or awkwardly shaped. Vehicles: As a special items moving company, we have years of experience moving automobiles, boats, jet skis, four wheelers, dune buggies, and other motorized vehicles. We do ask clients to remove personal items and anything that could shift around during the move. Batteries should be disconnected and fuel emptied. It is advisable to talk with a staff member beforehand to understand this specialty item moving process. Large TVs or Entertainment Centers: Moving a very large TV, entertainment center, or other digital equipment can be complicated. This devices often require special methods of packing to reduce the risk of damage. Regardless of what type of specialty items you have, you should let a capable and experienced moving company handle the job. 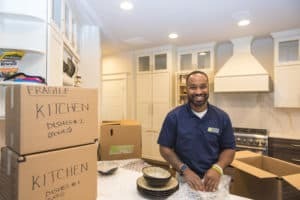 When you hire a moving company Washington DC residents trust with specialty items, you not only eliminate the hassle and stress of moving the items; you also eliminate any possibility of getting injured during the moving process. Whether you’re moving down the street or into a new state, you’ll want to have a team of movers that you can depend on. To learn more about our specialty items moving services, please call Suburban Solutions today.